FIG. 6. 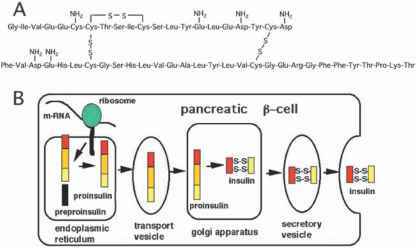 PEC-mediated mutagenesis in coincubated B cells. (A) Shuttle vector-free PECs, the effectors of mutagenesis, were cocultured with LPS-stimulated splenic B lymphoblasts (LPS blasts), the targets of mutagenesis. LPS blasts contained either ALIZ or pUR288. (B) Mutant frequencies in LPS blasts were measured with the help of the /-LIZ or pUR288 assay, either in the absence of PECs (±TPA) or the presence of PECs (±TPA). 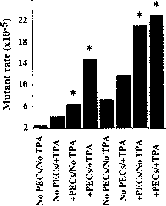 Significant increases in mutant frequencies (with respect to background levels found in the absence of PECs and TPA) are indicated by asterisks. Note that mutant frequencies were higher in all four samples in the pUR288 assay. This was caused, at least in part, by the ability of the pUR288 assay to detect large deletions and recombinations, two classes of mutations that are missed in the ALIZ assay. Plaques (6-17.6 x 10s) were screened in the ALIZ assay and 0.95-2.0 x 105 colonies were screened in the pUR288 assay in the different experimental groups. spectra can be analyzed at the DNA sequence level. The approximately 1-kb-long target gene, lacl, is not only three times smaller than the target gene of the pUR288 assay, lacZ, but most of the mutations are restricted to the 250-bp region of lacl that encodes the DNA-binding domain of the Lacl repressor. This further reduces the sequencing effort. In addition, the database of known mutations in lacl is huge, greatly facilitating interpretations of observed mutation profiles with well-established standards. Thus, the pros and cons of A.LIZ and pUR288 should be carefully weighed in order to choose the appropriate assay for an envisioned mutagenesis experiment. We acknowledge Dr. Scott Provost (Stratagene) for teaching K.F. the ALIZ assay and providing ALIZ transgenic B6 mice for backcrossing. We are grateful to Drs. Martijn Dolle and Jan Vijg (Cancer Therapy and Research Center, University of Texas Health Science Center at San Antonio) for training L.R. in the pUR288 assay and providing the pUR288 transgenic B6 mice for backcrossing. We are equally grateful to Dr. Michael Boerrigter (Leven) for sharing his expertise on the pUR288 assay and many fruitful scientific discussions. We are indebted to Drs. Sharon Jackson and Steven Holland (NIAID, NIH) for the kind gift of p41phox knockout mice. We thank our long-term collaborators, Drs. Georg-Wilhelm Bornkamm (Institute for Tumor Genetics and Clinical Molecular Biology, GSF, Munich) and Michael Potter (Laboratory of Genetics, National Cancer Institute, NIH) for supporting these studies.